Need a simple, inexpensive and reliable way to protect the data and systems critical to your small business? 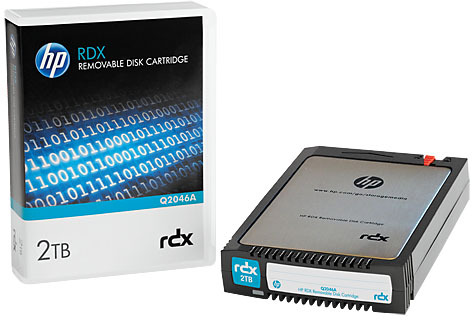 The HP RDX Removable Disk Cartridge delivers an easy-to-use, affordable, rugged and removable data protection cartridge for workstations and entry-level servers. Backups are simple and pain-free with drag and drop file access. Fast disk based performance provides the ability to store 160 GB, 320 GB, 500 GB, 1 TB of data on a single removable disk cartridge at speeds of up to 108 GB/hr. Long lasting removable disk cartridges and forward and backward compatible RDX docking stations reduce ownership costs. 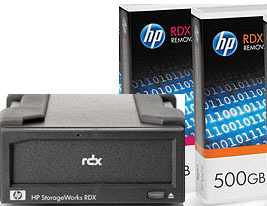 When used with an HP StorageWorks RDX Backup System the solution seamlessly integrates with HP Continuous Data Protection Software providing complete data protection and enabling simple and secure offsite storage. The simple way to protect your business data, reduces the total cost of protecting your business data and works in a broad set of small business operating environments. Backup made easy: The HP RDX Removable Disk Backup System drag-and-drop file access makes backup as simple and convenient as the click of a mouse. 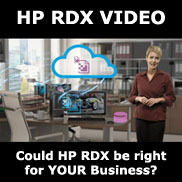 For a “hands-free” backup experience, use the HP RDX Continuous Data Protection Software designed for ease-of-use and with complete workstation and server backup protection. Spend less time on backups: Backup data at fast hard drive speeds (up to 108 GB/hr) and restore critical files in seconds instead of hours with random disk access. Easy scalability and expandability: Flexibly meet your budget and capacity requirements with a choice of 160 GB, 320 GB, 500 GB, or 1 TB removable disk cartridges. 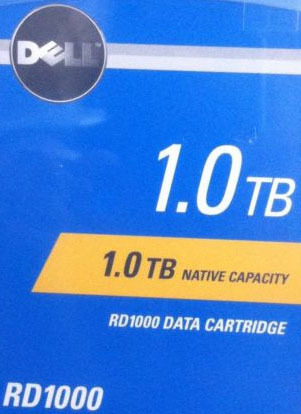 Scaling capacity is simply a matter of adding cartridges. Plug-and-play implementation: Easily connect the USB docking station internally to a server, rack‑mount kit, or externally as a tabletop. Insert a removable disk cartridge into the docking station and the cartridge automatically appears as a letter drive in Windows Explorer with no extra steps or formatting. Affordable cost of ownership: Lower on-going media and upgrade costs with disk cartridges designed for long usage life. Future proof: The HP RDX Removable Disk Backup System docking station is designed to work with all current and future higher capacity removable disk cartridges so the system is fully multi-generational. 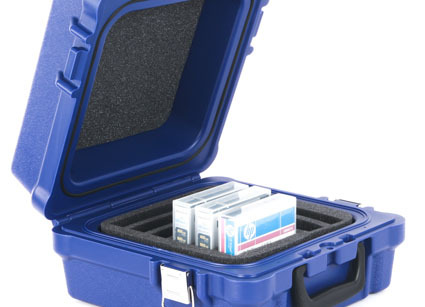 Rugged removability: Rugged, portable, and durable removable disk cartridges enable business critical backup data to be simply and securely taken offsite for disaster recovery, archiving, or data transfer. Reliability: Reliable long-term data retention is enabled with docking stations specified for more than 10,000 load and unload cycles and individual RDX cartridges specified for over 5,000 load and unload cycles and long life expectancy. Compatibility with range of hardware and software: Suits almost every small business-operating environment. Small form factor and choice of models: Available as half-height external, internal, or rack-mount models to fit both servers and workstations. The HP RDX Removable Disk Backup System offers free HP RDX Continuous Data Protection Software for continuous, automatic, and complete server and workstation backup protection. Key features include continuous data protection, file deduplication, bare metal restore, seamless cartridge rotation and archiving support, simple file recovery, complete backup coverage (unlimited file versions, open files, application data user settings, and the complete operating system are all automatically backed up), and comprehensive backup status updates.